Event Admission: $25 GA, $35 Early Bird. Admission includes 12 wine tasting tickets. Additional tickets can be purchased at the event. For more ticket information visit Kirkland Chamber. 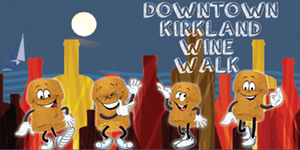 To purchase tickets visit Kirkland Holiday Wine Walk Tickets. Early Bird ticket holders start at 5 pm, and GA ticket holders start at 6 pm. Event will end at 9 pm.